This printed glass apothecary jar encourages you to be thankful and present. Take a second to be mindful next time you find a penny or some spare change. As you watch the jar fill up, you’ll build a habit that helps you focus on the positive things in your life. Dimensions: 9" x 4.5" x 4.5"
Bought several for Christmas gifts this year. Quality and presentation are both extremely nice. These jars are great gifts. The script painted on them is really well done. It’s a great way to remember to be grateful for your blessings. These printed glass gratitude jars encourage you to be more present and set aside moments of thankfulness. Practicing appreciation instills our day-to-day with a spirit of happiness and mindfulness. Some studies even show that it has a positive effect on our health. 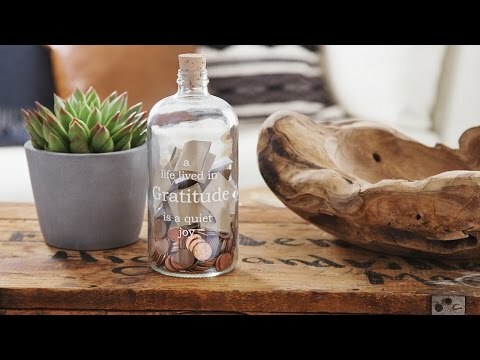 Studio Penny Lane jars prompt you to show gratitude—and it’s up to you to choose how. 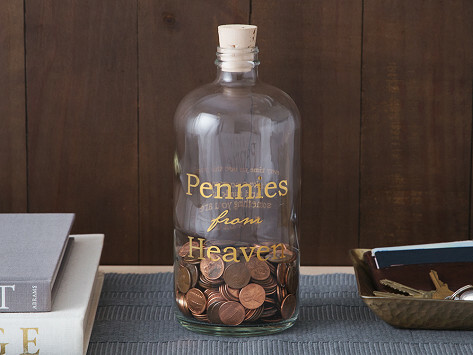 Fill these jars with daily notes or reminders of the blessings in your life, big and small. Or next time you find a penny or some spare change, take a second to be mindful of the moment as you drop it in the jar. Maker Laurie Libman-Wilson found solace in practicing appreciation after the death of a dear friend. In the midst of hardship, she realized gratitude really could go a long way. These jars are the perfect catalysts for taking tiny appreciation breaks, which can benefit your mind and spirit.